The latest mission by NASA to explore Mars will explore the geology under the surface for the first time. The NASA InSight speacecraft, launched May 12, 2018, is on its 300 Million mile trip to the planet Mars with an expected landing there on November 26, 2018. The launch at Vandenberg Air Force Base in California. of the United Launch Alliance Atlas V rocket and the upper stage Centaur with the InSight package went smoothly. At NASA's Jet Propulsion Laboratory, Pasadena, California, Andrew Good and D. C. Agle described the launch sequence: "Riding the Centaur second stage of the rocket, the spacecraft reached orbit 13 minutes and 16 seconds after launch. Sixty-one minutes later, the Centaur ignited a second time, sending InSight on a trajectory toward the Red Planet. InSight separated from the Centaur about 9 minutes later -- 93 minutes after launch -- and contacted ground controllers via NASA's Deep Space Network at 5:41 a.m. PDT (8:41 a.m. EDT)." 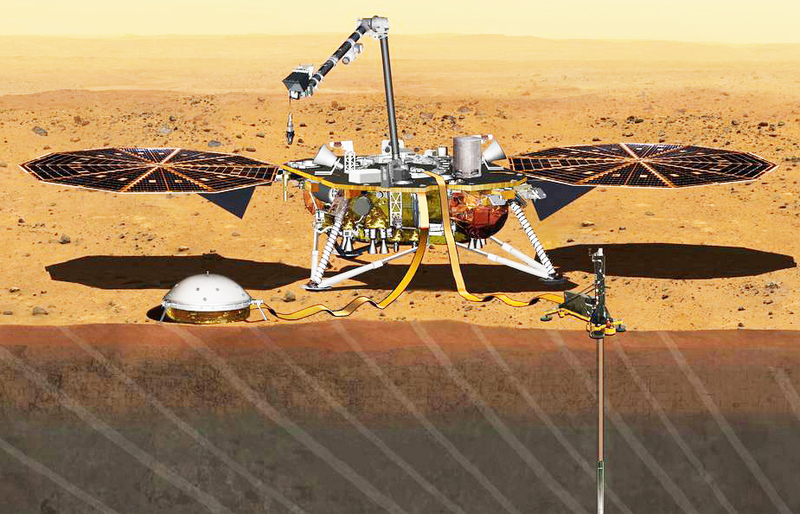 "This artist's concept depicts the InSight lander on Mars after the lander's robotic arm has deployed a seismometer and a heat probe directly onto the ground. The official name of the program is the Mars Interior Exploration using Seismic Investigations, Geodesy and Heat Transport. InSight is the first mission dedicated to investigating the deep interior of Mars. The findings will advance understanding of how all rocky planets, including Earth, formed and evolved," according to NASA. According to NASA, the goal of InSight once on Mars is to "study the planet's interior by measuring its heat output and listen for marsquakes. InSight will use the seismic waves generated by marsquakes to develop a map of the planet's deep interior. The resulting insight into Mars' formation will provide a better understanding of how other rocky planets, including Earth, were created." This is the latest Mars exploration program but the first designed to explore deep into the Mars' surface as part of geology evolution studies of rocky planets such as Mars and the Earth. The mission's international science team includes researchers from Austria, Belgium, Canada, France, Germany, Japan, Poland, Spain, Switzerland, the United Kingdom and the United States. Marc Pircher, director of France's National Centre for Space Studies at the Toulouse Space Centre in France said, "The shared and renewed commitment to this mission continues our collaboration to find clues in the heart of Mars about the early evolution of our solar system." Good at NASA explained, "One key way InSight will peer into the Martian interior is by studying motion underground -- what we know as marsquakes. NASA has not attempted to do this kind of science since the Viking mission. Both Viking landers had their seismometers on top of the spacecraft, where they produced noisy data. InSight's seismometer will be placed directly on the Martian surface, which will provide much cleaner data.Scientists have seen a lot of evidence suggesting Mars has quakes. But unlike quakes on Earth, which are mostly caused by tectonic plates moving around, marsquakes would be caused by other types of tectonic activity, such as volcanism and cracks forming in the planet's crust. In addition, meteor impacts can create seismic waves, which InSight will try to detect." The launch was multi-purpose according to Good, "The rocket that lofted InSight beyond Earth also launched a separate NASA technology experiment: two mini-spacecraft called Mars Cube One, or MarCO. These briefcase-sized CubeSats will fly on their own path to Mars behind InSight. Their objective is to relay back InSight data as it enters the Martian atmosphere and lands. It will be a first test of miniaturized CubeSat technology at another planet, which researchers hope can offer new capabilities to future missions. If successful, the MarCOs could represent a new kind of data relay to Earth. InSight's success is independent of its CubeSat tag-alongs." Thank you for visiting Information Works inc.